The size of new Australian houses is four times bigger than those in Europe. There is a waiting list for locally built V8 cars. 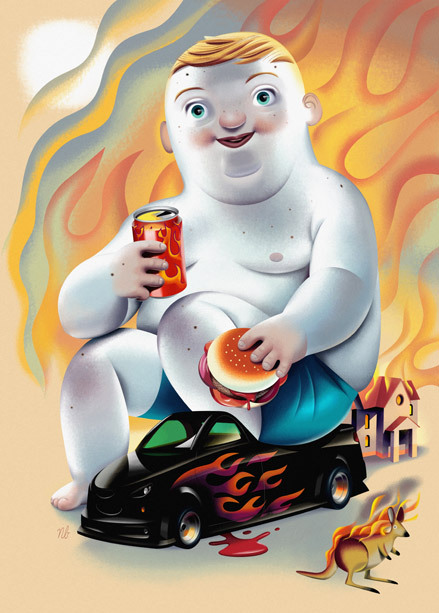 Australian children are among the most obese in the world. Meanwhile the effects of rampant consumption are starting to manifest in global warming and unstable weather patterns. The question has to be asked; when will we start moderating our consumptive cultural tendencies? Sydney based illustrator Nigel Buchanan is originally from New Zealand. World wide commissions have ranged from several stamps for Australia Post to huge murals at Sydney's Taronga Zoo, but most have been for the publishing industry. Nigel has delivered lectures to illustration and design students at many Australian colleges. His work has been featured in Communication Arts illustration annuals, 3x3 illustration Annuals and Leurzer's Archive. He has recently won a silver medal from the New York based Society of Illustrators, and been profiled in 3x3 magazine.